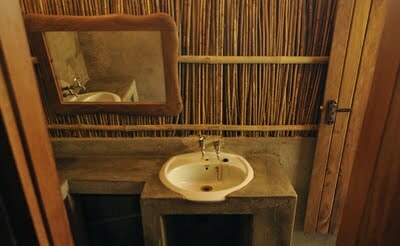 Gorongosa Mountain more accessible than ever for birders. Gone are the days when visiting Mount Gorongosa in Central Mozambique was a major mission, requiring several days, lots of patience and considerable endurance!! Thanks in no small part to the pioneering efforts of a young man called Sakkie van Zyl, the trip is now much simplified. 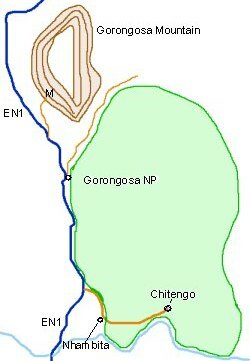 Map of the Gorongosa Area. 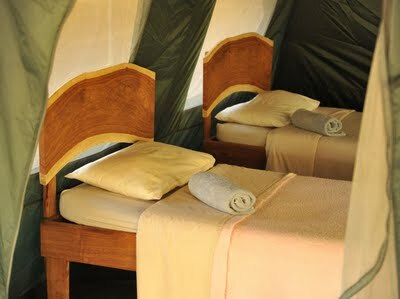 Nhambita is the site of the Gorongosa Adventures Camp, just 3km from the gate of Gorongosa NP. From the camp to the start of the track up to the parking area at "M", it is 52 km. The Van Zyl family have been living in the area for 9 years, and Sakkie is fluent in the local language. He has reached an agreement with the regulo at Canda (on the western side of the mountain) whereby visitors can be taken up on an organised basis. One can only climb Gorongosa with the approval of the local Chief (Regulo) and Gorongosa Adventures takes care of all the formalities on behalf of visitors. This means that one can arrive at the Gorongosa Adventures Camp (just outside the National Park) late in the evening, and next morning be heading up to the Mountain. Parts of the track require 4x4, and Gorongosa Adventures provides a Land-cruiser "Game-drive" vehicle which is the ideal vehicle for birding on the way up to the start of the walk. Sakkie and his team provide guides, who will also help as porters on the gentle 3.4km walk up to the forest. There are two well established routes to the forest, both of which provide excellent birding. This is no one bird mountain and typically provides for one of the bigger "lifer days" of any of the birding localities in Central Mozambique. Species often encountered on the walk up to the forest include Variable Sunbird, Short-winged Cisticola, Grey-rumped Swallow, Singing Cisticola, Moustached Grass-Warbler, Anchietas' (Marsh) Tchagra and even Lesser Seedcracker. Yellow-bellied Waxbill, Grey Waxbill, Broad-tailed Warbler, Augur Buzzard, Livingstones' Turaco, Pallid Honeyguide, Golden Weaver, Purple Indigobird, Dark-capped Yellow-Warbler, Red-throated Twinspot and Eastern Saw-wing may also be encountered. Once in the forest, one is amazed at the size of the trees and the number and variety of bird species. Common forest species include Cape Batis, Dark-backed Weaver, Yellow-rumped Tinkerbird, Livingstone's Turaco, Stripe-cheeked Greenbul, Yellow-streaked Greenbul, Black-fronted Bush-shrike, Chirinda Apalis, Grey Cuckoo-shrike and Olive Sunbird. Of course there is the legendary Green-headed Oriole which usually make their presence felt by calling continuously. Also present in some parts of the forest are Red-faced Crimsonwing, White-tailed Crested Flycatcher, Pallid Honeyguide, Swynnerton's Robin, Bronze-naped Pigeon, White-starred Robin and White-chested Alethe. If staying at Nhambita Camp there are no restrictions on time of departure, and our normal approach is to leave early, to reach the 4x4 track before sunrise, which allows one to bird and walk in the productive and pleasant early morning coolness. It also allows for plenty of time in the forest, which is always well worth it, as bird parties come and go. The trip up Gorongosa can be accomplished in time to still do some birding in and around Nhambita Camp, and this area can be excellent for Miombo and woodland species. Top of the list are Speckle-throated Woodpecker, Short-winged Cisticola, Red-winged Warbler, White-breasted Cuckoo-shrike, Broad-tailed Paradise-Whydah, Zambezi Indigobird, Red-throated Twinspot, Orange-winged Pytilia, Arnot's Chat, Thick-Billed Cuckoo, Southern Hyliota, Green-backed Woodpecker, Green-capped Eremomela, Grey-headed Parrot, Raquet-tailed Roller, Silvery-cheeked Hornbill and Ayre's Hawk-Eagle. Pennant-winged Nightjar is present in Summer and raptors are plentiful, with Ovambo Sparrowhawk, Shikra, Lizard Buzzard, Bateleur and African Cuckoo-Hawk all regular. African Crowned Eagle and Pel's Fishing Owl are also possibilities. To reach Nhambita, take the road to gravel road to Gorongosa National Park from the EN1 National Road. 8 Km along this road (about 3km before the Park Gates) there is an old Stone Church on the right. Turn right just before the Church and after a few 100m the camp is on your left.